Foodies have long been used to criticising Japanese restaurants for trying to do too much on one menu. Anywhere attempting to master the art of udon, ramen, tempura and sushi at all one time under one roof is opening themselves for scorn from People Who Know Better (ahem), as (as anyone who Knows Better will tell you) you can't possibly hope to master all these completely different styles of cuisine in one go. It's just Not Done. As to why we don't hold other cuisines to the same standards, your guess is as good as mine. Seems we're happy to visit "French" restaurants or "Italian" restaurants or "Chinese" (to some extent, although regional Chinese has become more of a thing recently) restaurants that offer dishes from one corner of their vast nations to the other, but not Japanese. You have your favourite ramen place, your favourite sushi place, and so on. Ultra-specialisation, that's the way to go. But why not ultra-specialisation from other world cuisines? Why not, for example, a specialist Indian biryani joint? And so, here we have Dum Biryani, a refreshingly straightforward rice'n'pastry peddler tucked underneath Wardour Street, which makes sense of the whole specialisation business by doing (more or less) one thing, and doing it very bloody well indeed. But before the biryani, there's a short selection of "snacks" well worth dipping in to, not least because the biryani themselves are (correctly) cooked to order and take 25 minutes to arrive. The "kodi vepudu" chicken wings had a fantastically complex masala dressing and showcased good, strong chicken, even if the texture of the skin would have benefitted from a bit of char-grilling. It's hardly Dum Biryani's fault they don't have a tandoor, though, so I won't hold that against them. Having never been to India, I can't tell you exactly how authentic this tray of food is compared to what you'd get in Delhi, but it certainly feels like the real deal. There are no giant poppadums common to the English curry house, no mango chutney or lime pickle, just a smattering of rustic homemade (I assume) papads, a little pot of mirch salan with half a boiled egg, a portion of tomato kachumber, some raita with fried okra, and of course a giant ceramic pot sealed with golden brown pastry. And the further good news is, the biryani is wonderful. Perhaps, if I'm being brutal, not quite as knockout as the venison version served at Gymkhana (at twice the price), but still a supremely accomplished bit of cooking, the multicoloured folds of fragrant steamed rice hiding giant chunks of moist, flavoursome lamb, and the delicate flaky pastry that sealed it all in is a meal in its own right, buttery and satisfying. It's a biryani made by people who love biryanis, comforting and familiar as a warm embrace. In short, it's a great little operation. 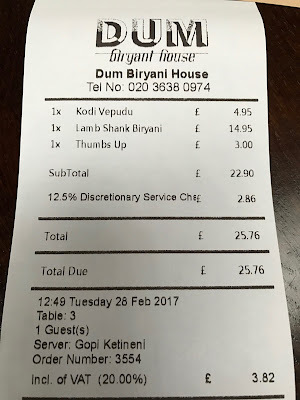 Service was friendly and enthusiastic, even from the start before ex-Trishna and JKS manager Gopi Ketineni spotted the weirdo taking photos and disappeared into the kitchens to brief the staff. In amongst unintelligible Hindi I caught my name and the words "Cheese and Biscuits" and every now and again a head ever-so-slowly peeped around the side of the kitchen door, only to retreat immediately after catching my eye. I only mention it in the interests of full disclosure; I'm certain it would have had no impact on the food. If this is the first of many Indian ultra-specialisation joints (what's next I wonder? A butter chicken specialist? Masala fish?) then it's a sign of very interesting things to come, as clearly in this case at least the concept is an unqualified success. If not, and nobody else is brave enough to take up the trend, well at least we'll have Dum Biryani, an ideal showcase for one of the truly great Indian dishes. Much as I try and keep an open mind about these things, I've been doing this restaurant blogging thing long enough, and have been burned enough during that time, to build up quite a healthy prejudice against proto-chains. Objectively there should be no real reason why a proto-chain (that is, a restaurant designed from the get-go to be the first of many) wouldn't be any less enjoyable than any independent joint - both, after all, are still in the business of feeding you food you want to eat at prices you want to pay - except, well, the reality just doesn't bear this out. There are, I'm sure, more reasons for the gap in quality between proto-chains and other restaurants than I could ever realistically go into here, but perhaps the main issue is simply one of attitude. If you start up as an independent restaurant, do better than you'd hoped and scrape enough money together for a second branch, well there's a dignity and humility in that - you've started up for the right reasons, and through good fortune have tapped into a demand. All chains have to start somewhere, I suppose, but how much better to be MeatLiquor or Bone Daddies, growing from a single branch to a nationwide (and international) chain through the sheer superiority of your product, rather than having the gumption to gather a group of investors, ask them to cough up a few million quid and have a nice logo designed. It all seems a bit... cynical. You may quite naturally assume I'm setting Tandoor Chop House - unashamedly a proto-chain - up for a slating, but of course these things are rarely black and white; if they were, my job would be a lot easier. There's actually a lot to like about the place, not least of which is the seekh kebab roll (not pictured sorry, my photos didn't come out), which comes in a nice earthy coriander dressing and has a remarkable kick of spice. Well worth a fiver. Or this beef dripping keema naan, which (on my first visit at least) had a great fluffy naan base and a hugely enjoyable beef mixture on top. Cherry tomatoes didn't add much, but then they never do. "IPA" battered squid and prawns were interesting too, not very Indian perhaps but with a nice tasty batter and containing good chunks of tender seafood. I didn't much like this tuna tartare thing. Maybe it was just difficult getting my head around eating raw fish in an Indian restaurant, or maybe it just didn't taste very nice - a bit bland and unsettling. Yes, pretty sure it's the latter. On the subject of the main courses, there are two stories to tell. On my first visit, the lamb chops (above) were superb; perfectly chargrilled, expertly spiced and fantastic fun to eat. You could not want for a better lamb chop. Well, you could, there are probably a few better ones in town (*cough* Tayyabs *cough*), but the point is, they were very good, as you might well hope at a price point of £16.50 for three. Also excellent (on my first visit) were the chicken tikka pieces, moist and tender and coated with a beguiling spice mix easily the match of any "posh" Indian restaurant in town. With just a touch of char from the tandoor, and a scattering of fresh coriander, they too just about made sense of the £12 price point. Had my review ended there, with a couple of decent starters and a couple of genuinely enjoyable mains, Tandoor Chop House would have been in the running for at least a 7/10 score and a pat on the back. Unfortunately - for them and me - I went back one lunchtime and ate the above, "green masala pollock", which is probably the most disgusting fish dish of any kind I've ever paid for. Pollock, a cheap, nasty fish, grey and mushy and with a horrid thin flavour, needs a great deal of intelligent treatment to make it edible (I believe it's the main ingredient for fish fingers, which is fair enough), but here, soaked in a weird grassy, underseasoned dressing, it just tasted all kinds of wrong, the memory of a good idea gone old and ill. Try and imagine the exact opposite of the wonderful Haryali Sea Bream dish from Trishna, as if cooked by the demon from Stranger Things in the Upside Down, where everything is decrepit and evil. And in fact, on my second visit even the Chicken Tikka was a bit sad and dry, not wholly unedible (certainly not as bad as the pollock) but still not quite right, as if some of the joy (or at least the expertise) had left the kitchen. This could have something to do with the launch week chef moving on, but you would have at least hoped he'd leave a competent team behind him. On a similarly concerning vein, the naan bread, which had been so fluffy and bubbly and full of life in launch week, had settled into the sad, dense, doughy thing you see above by my second visit. As to the cause, who knows, but clearly something wasn't right. Consistency, especially for a proto-chain but really for any restaurant, is the difference between success and failure. And though I moan about the drop in standards at Tandoor Chop House since opening it's still relatively early days and they still have plenty of time to inject a bit of passion and attention to detail back into their offering. I'm pretty sure nothing would be able to redeem that awful pollock dish but in the case of the bread and the chicken it's probably just a case of going back to basics. Who knows. In a way, I'm glad it's not my problem and all I need to do is carp from the sidelines. But it's important to stress that I didn't have an uneven time at Tandoor Chop House just because it's a proto-chain. Yes, I do carry a prejudice about them and maybe even with my most objective head on they would have had to try a bit harder to curry my favour (no pun intended... OK maybe a little pun intended). But I mainly can't recommend the place because the food is only occasionally worth the money they're asking for it. And that's a problem, chain or no chain. I was invited to the launch week meal, but have paid my way since. Apologies for the lack of bill photo, I forgot to take one, but their website have the prices. Ennismore have asked me to point out that the head chef is still most definitely there and hasn't moved on, but was on holiday for one of my subsequent visits. What a versatile little animal the crab is, able to carry the centrepiece of a £100 fruit-de-mer at the poshest joints in town, fill out a Chinatown seafood dish for a few quid, and perform a thousand different feats in-between, buttery white meat in a salad, brown meat to provide an earthy seafood tang to a curry; bisques, broths, parfaits and pasta, there's almost nowhere it can't go. And I'll happily wolf down all of it. So the idea of a specialist crab restaurant (at least one that doesn't require a 2nd mortage - Beast I'm looking at you) is long overdue, and to this particular crab enthusiast, extremely exciting. CLAW is, like so many of the most dynamic new restaurants, a former streetfood operation, often seen at festivals up and down the country, that have "gone popup" and taken over the dining room at Sun & 13 Cantons vacated by the wonderful Darjeeling Express (soon themselves to go permanent in Kingly Court). This building has been home to some really good stuff over the years, acting as a king of halfway house between a van at a festival and a proper restaurant with rates and regulations and Tripadvisor to worry about. If you can make it here, as Frank Sinatra never said, you can make it anywhere. Or at least figure out if there's a local audience for whatever it is you're doing. First signs I wasn't quite going to get what I wanted out of Claw came with the arrival of the menu. 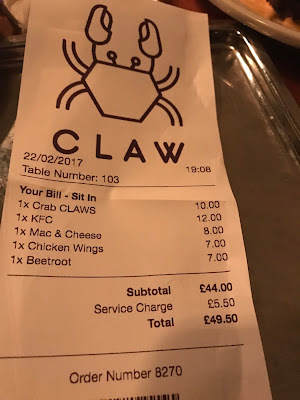 For a place calling itself "CLAW", with a tagline "It's all about the crab", am I entitled to expect more than just three crab dishes out of 13 items? The website bemoans the fact Britain exports 80% of its crab, and yes it would be great to see a few more of them ending up on tables in this country. But then why serve soft-shelled crab, presumably frozen and flown in from abroad? How does that fit in with this philosophy? So with no sign on the Soho menu (just one menu between two, perhaps there was a shortage of paper as well as crab) of their "famous" crab burger, or crab sandwich, or crab fries or any of the other dishes on their website gallery, we were forced to start with the cracked claws with "lime butter". Decent fresh crab, cooked accurately but overwhelmed by the pong of garlic and desperately needing a wedge of lemon or lime to cut through the grease, it was at least crab, and looked the part. Soft-shelled crab was, like they sadly so often are, just a vehicle for batter and cooking oil, having little to no seafood flavour and not particularly fun to eat. We did eat it, because we were hungry and we'd come to a crab restaurant for some crab, dammit, but it was hardly worth the journey. The kimchi was nice though. Chicken wings, ordered more out of hope than expectation, were sweet and sickly, the kind of thing you'd get anywhere these days with the word "dirty" or "smoke" somewhere in its name. With a heavy heart I noticed the wingtips had been left on. Crab mac & cheese was the highlight of the dinner, and by highlight I mean the only bit I'd order again. Brown crab meat, I assume, had been used to fill out a good gooey cheese mixture and there was an attractive crust of cheddar on top. I didn't try the beetroot, because I don't much like beetroot, but my friend noted only that they'd left the hairy stalks on the top and they were "like eating pipe cleaners". Perhaps this, and the wingtips left on the chicken wings could be seen as charming traits of an amateur cook, but to me it just feels like laziness. 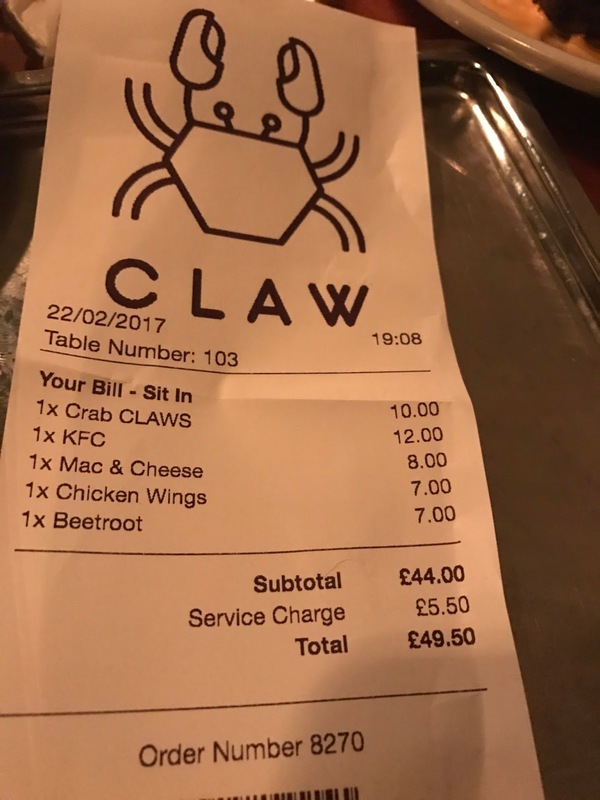 The bill came to £50 with no booze, and although we are talking about two (and a half) dishes of proper fresh crab which isn't, and should never be, a budget food, it still seems like a lot for a very uneven dinner, especially with places like Wright Bros just around the corner. And yes, perhaps if they hadn't called themselves CLAW or gone on about famous crab burgers and crab fries on their website I wouldn't have turned up expecting all these things, but that's hardly my fault. "It's all about the crab"? If only. First of all, apologies for the drop in usual photographic standards on this post. This meal at Laughing Heart was completely impromptu, the result of there being nothing on TV on a Sunday night during a trip to see a friend in Shoreditch, and I didn't have my Big Camera. So if the food looks a bit less appealing than it would do normally I can only apologise (to them and you), but on the other hand my mate didn't have to put up with my taking ten or fifteen shots of every dish with my noisy compact, so you know, he was happy. It is quite extraordinary to see the way this part of town has developed over the last few years. What was once a bleak and rather grotty thoroughfare to somewhere else now plays host to a number of seriously good food and drink options, with wine bar Sagar & Wilde stood next to Morito, just down the road from super gastropub the Marksman. 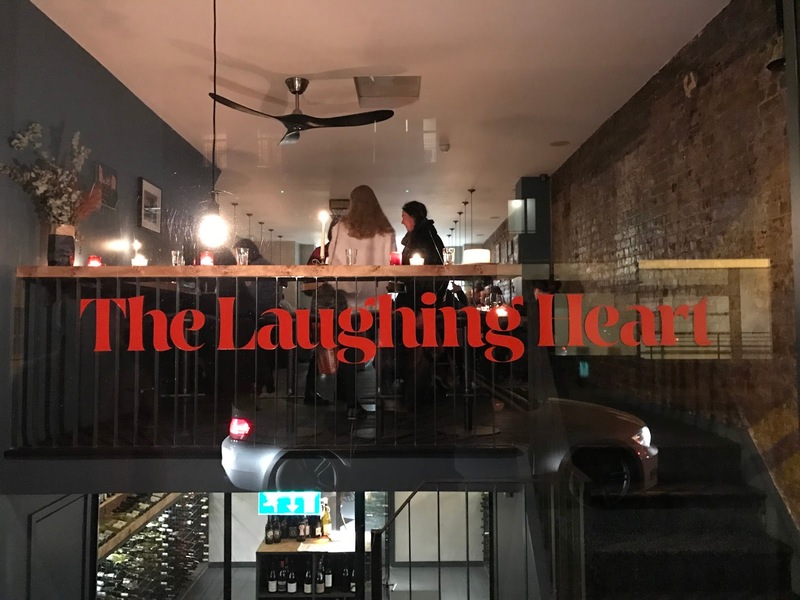 The Laughing Heart, then, slots comfortably in to a mature and dynamic restaurant scene, with a local audience quite used to all this small plates and seasonal palava, thankyouverymuch. On Sunday evening, the place was buzzing - if not at capacity - with lucky Hackneyites making the most of the latest lovely thing to land on their doorstep. Oysters X.O. were the first to arrive. 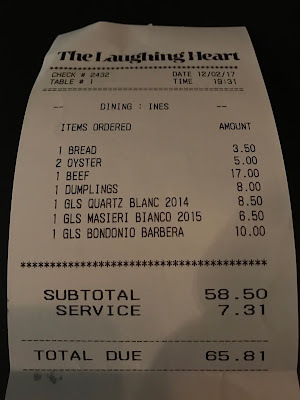 You'll notice that a lot of the items on the Laughing Heart menu are Chinese-inspired; I'm not sure whether this is a permanent direction or just something they'd put on for Chinese New Year. 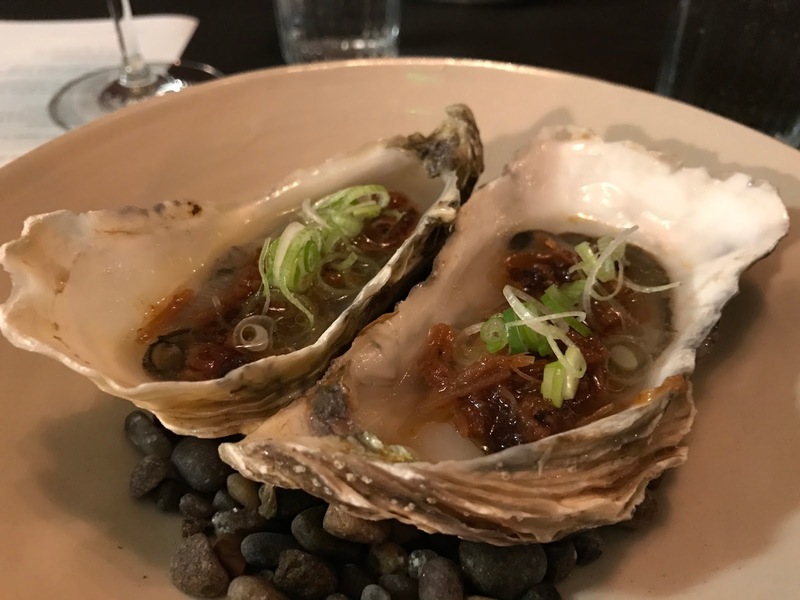 Either way someone in the kitchens has a real affinity for this kind of thing as the balance of dressing, herbs and seafood was spot on, ginger and spring onions and presumably soy and vinegar sitting very nicely with the plump winter bivalves. I like to think I can divide the population into two categories - those who are unable to read "Brown crab butter" and not order it immediately, and those who will live a sad and empty life devoid of fun or meaning. I am in the former. 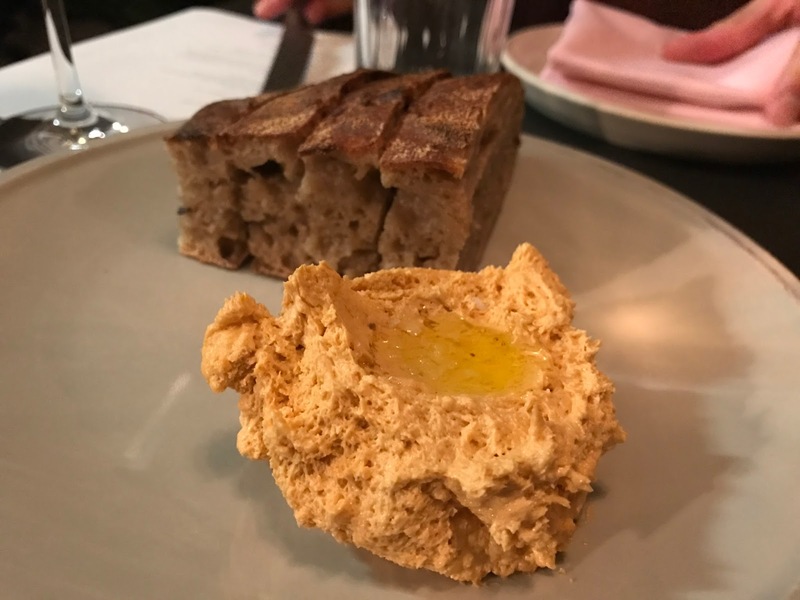 It was wonderful; fluffy and smooth and rich with seafood like a fine, buttery taramasalata, and has by all accounts already become somewhat of a signature offering. The sourdough it came with was also fantastic, as you might expect given there's quite the choice of top bakeries in these parts. 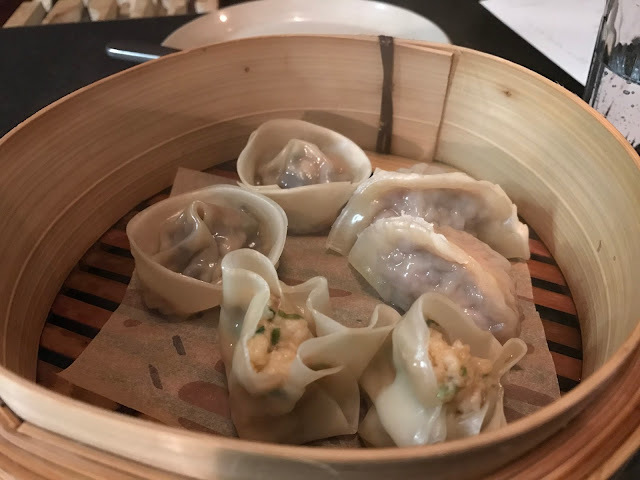 Next, dumplings, and very good dumplings too, with great delicate casings and lovely vibrant fillings. My favourite was pork and fennel, which had a particularly impressive aromatic kick. As I said, someone at Laughing Heart really knows their Chinese food discipline, and isn't afraid to show it off on a menu that's otherwise solidly Modern European. Ordinarily I'd probably say something about geographic vagueness, but I mean, what the hell, life's too short. 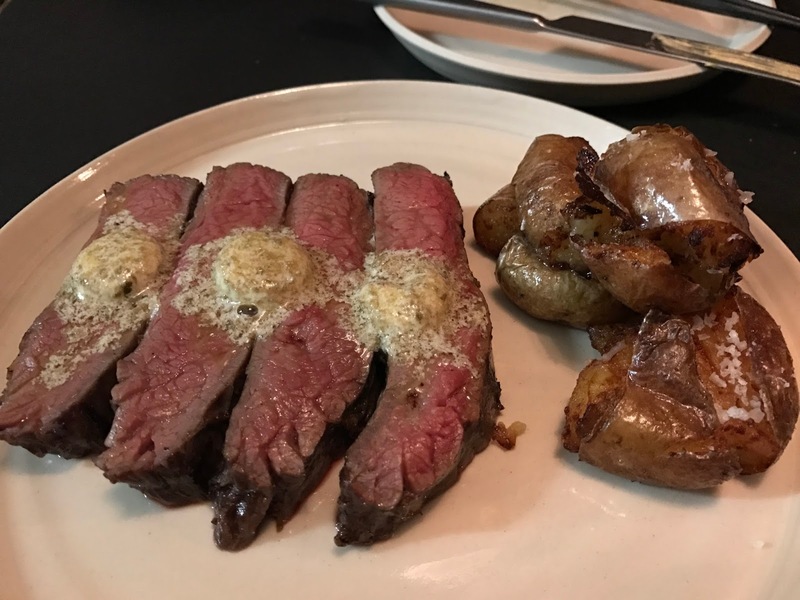 With beef in herb butter and fried potatoes were were firmly back on British soil, and by using 9-year-old ex-dairy cattle they were pushing all the on-trend butchery buttons too. The beef was tender and had a decent flavour, though was by no means knockout; I like a bit more of a chargrilled crust on my steaks, though that may just be a personal thing. The accompanying potatoes were less easy to love, a strange mangled shape and not tasting of a great deal. But overall, it was a very pleasant meal for a very decent amount of money, and we left happy. The strange hybrid Chinese-Gastropub menu could have very well been a disaster in lesser hands, and while it's true the dishes tended to sit alongside each other rather than combining into some kind of coherent concept, the fact is it was all done so well you could hardly moan too much. To paraphrase Joey from Friends, "Sourdough and brown crab butter? Good. 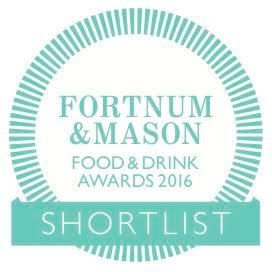 Game & foie gras terrine? Good. Dim sum dumplings? Good!." 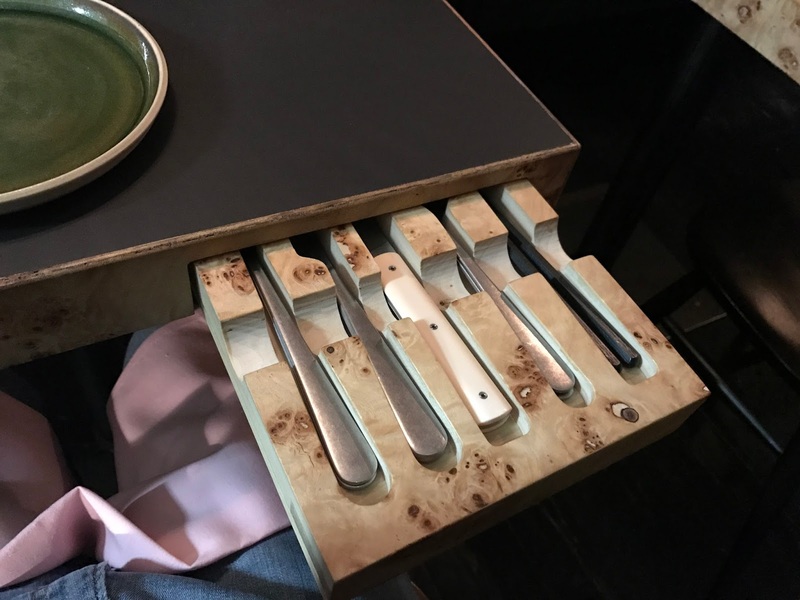 So if it seems extraordinary how much Hackney has changed in recent years, surely more extraordinary is that the pace of innovation and invention in the restaurant industry seems only to accelerate. Laughing Heart is an energetic little place with a singularly eccentric vision of what it means to eat out, and yet by the standards of what we've come to expect in London, it feels neither forced nor particularly unusual. A Chinese-European gastropub. Why the hell not.